Happy Birthday, Brad! Welcome to 41! Well, we’re on the third week of The List, and I think it just might be a winner. Not everything gets done, but some of it does, and that’s alright with me. We’ve decided that “Cook One Giant Meal” should be added to The List, because if somebody cooks that, the rest of the week goes much better. I know some people don’t care for them, but if leftovers can save us from eating boiled stale crackers for dinner, then they have a purpose. 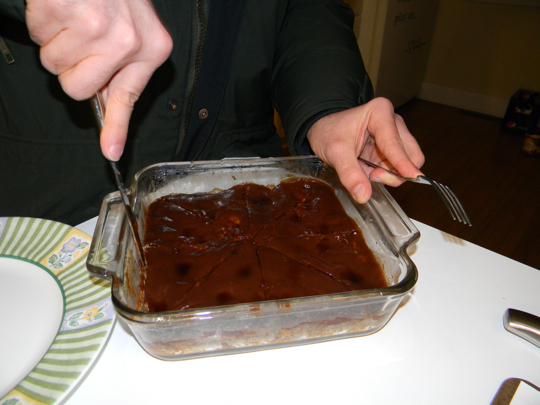 Lloyd took it upon himself to make the Giant Meal last week – it was a hunormous batch of meatloaves (3, in fact). We snarfed one up right away, froze one, and saved the other for tonight. He has really knocked himself out coming up with zany sauces, and has decided for maximum sauce-to-edge ratio, cutting it like a pizza is the way to go. If this cooking method increases the sauce ratio so well, why are meat loafs usually cooked in loafs? Is it just because of the name? I misspelled “loaves” on purpose to make it sound colloquial, but now that I look at it, it just looks like a mistake. I think loafes are good because you slice straight across and get edge all around and sauce on the top and both sides. Lloyd cooked these in bigger pans with lids (for future storage), so you lose the loafiness and it’s accompanying lohfy goodness. I’ve always made my meatloaf in a loaf (my kids say it looks more like a brain…a meatbrain). It never dawned on me to try it in a regular pan. I think I’m going to have to try this & see which I prefer. Thanks for the idea! We like the ends of the loaf the best & we fight over them. Did you put bacon on top? I tried that recently and it has me actually craving meatloaf. I would call it meatslice, with a bit of crust on all sides. Will you make a batch when/if you come this way, Lloyd? I’m not so sure that crisp is necessary. I’m thinking of those bacon wrapped fillets that I’ve seen, but never had.